This is a story of how we got here to our obesity and metabolic disease epidemic. Goes a bit back – around 30-40 million years – with another important Chapter that started about 45 years ago. It is a story about climate change, what happened during global cooling, about industrialized agriculture, and about dietary changes wayback then and now. And about how the gooey contents of thousands of grimy black rail tank cars seen everywhere in Iowa and the Midwest is making us sick because of what happened millions of years ago in icy Europe. We still are Great Apes in fact, though we don’t remember most things we have gone through in our long and challenging primate past. This story starts with two specific loss-of-function gene mutations that occurred long ago during our primate evolution, mutations that have huge implications today for dietary choices. These two gene mutations play a major causal role in the current world-wide epidemic of obesity, metabolic syndrome (central truncal obesity, hypertriglyceridemia, low HDL, high BO, and elevated FBS), type 2 diabetes, cardiovascular disease, and accelerated aging. No genotyping are needed for these two gene mutations that are mostly “primate specific.” These two mutations occurred during the late Eocene and mid-Miocene periods of primate evolution, during periods of global cooling and accelerated primate evolution. Together, the two gene mutations mean that we are all “double knock-outs” for very important genes that were essential for our survival as primate predecessors. The problem now, however, is that these knock-outs lead to high fructose-induced visceral fat build-up, which is the cause of metabolic syndrome, obesity, and type 2 diabetes (the 3 major disease scourges of our times). The basic argument is pretty simple. It is that during these ancient epochs of global cooling, our simian ancestors underwent two forever loss-of function gene mutations, one mutation (30-40 million years ago) wiping out our ability to synthesize Vitamin C, the other mutation (10-15 million years ago) undermining our ability to degrade uric acid. Back then, these mutations together enabled us to use fructose to accumulate layers of fat which helped us to stay alive during the long cold winters, a time when you could not go to a trendy Fusion restaurant, or pick up healthy ingredients from a Whole Foods, or order a pizza from a local shop. Nowadays fructose seems to be everywhere. High fructose corn syrup is stuff carried in grimy black railroad tank cars and is universally included in thousands of manufactured food and drink products. And the same layers of visceral fat give us the not-so-nice things we mentioned earlier – the current world-wide epidemic of obesity, metabolic syndrome (central truncal obesity, hypertriglyceridemia, low HDL, high BO, and elevated FBS), type 2 diabetes, cardiovascular disease, and accelerated aging. So, those two gene mutations – 50 and 15 million years ago – together with universal use of high fructose corn syrup in manufactured foods – starting about 45 years ago – have combined to give us a major health epidemic. The good news is that there are some very specific dietary and lifestyle interventions that can successfully prevent 100% of this modern day, 3-disease scourge. However, to really understand why these specific dietary changes makes such a difference in metabolic syndrome, obesity, and T2D, it is crucial to understand these two gene mutations. These gene mutations are the “crux” of the modern day scourge – visceral fat. 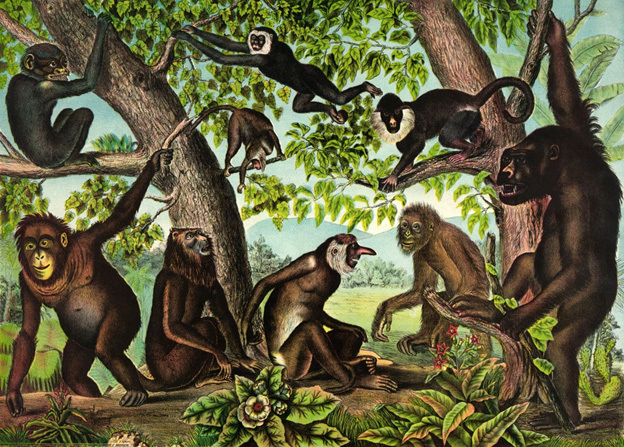 To understand how we reached this condition, we can start by considering climate change that occurred during primate evolution – the global cooling periods of the Eocene and Miocene epochs. Humans lost the ability to synthesize Vitamin C due to the deletion of multiple Exons in the L-gulono lactone oxidase (GLO) gene. In non-primate mammals, Vitamin C may be the single most important non-enzyme antioxidant. Denham Harmon’s “Free Radical Theory if Aging” would predict that a mutation in such a key antioxidant gene would not survive the “survival of the fittest” world of evolution. Denham Harmon’s theory would predict all animals with this mutation would become extinct. Instead, this mutation has survived 40 million years along the “evolutionary road kill highway”. Today, all primates carry this mutation except for prosimians, a feat that defies Hardy-Weinberg equilibriums in gene alleles. Today the GLO gene is so damaged that it is called a pseudogene and has not been transcribed to create a protein in 30 million years! The old explanations for why all primates have this loss-of-function mutation (except prosimians) does not “hold water”. For instance, Linus Pauling suggested that this loss-of-function mutation occurred because our ancestors were eating fruit and getting enough Vitamin C this way. But this does not explain why the mutation has reached nearly 100% penetrance! For such widespread expression of a mutant gene, there has to be what the evolutionary biologists call “positive selection pressure”. The abundance of fruit is not a “selection pressure”, especially in cold weather when there were no grocery stores open in the winter that carried fruit in the primate food section, 30 million years ago! LOL! In the late Eocene period, when the GLO gene mutation flourished, global cooling occurred due to declines in atmospheric CO2. This resulted in cold winters and seasonal food shortages. Richard Johnson and colleagues at the U of Colorado have hypothesized that the primates carrying the GLO gene knock-out were able to build up fat stores better than the primates carrying functional copies of the GLO gene. This is a much more plausible explanation for why this knock-out allele reaches nearly 100% penetrance in Eocene primates. Almost all primates carry another loss-of-function mutation in another antioxidant gene. Again, Denham Harmon’s “Free radical theory of aging” would predict that any mammal carrying such a gene mutation would become extinct! Instead, the knock-outs survived and the functional gene primates died off! (Sorry Mr. Harmon, but you should have studied evolution before you made up your crazy theory!) This 2nd anti-oxidant gene knock-out occurred much more recently – 10-15 million years ago, when another period of global cooling occurred. 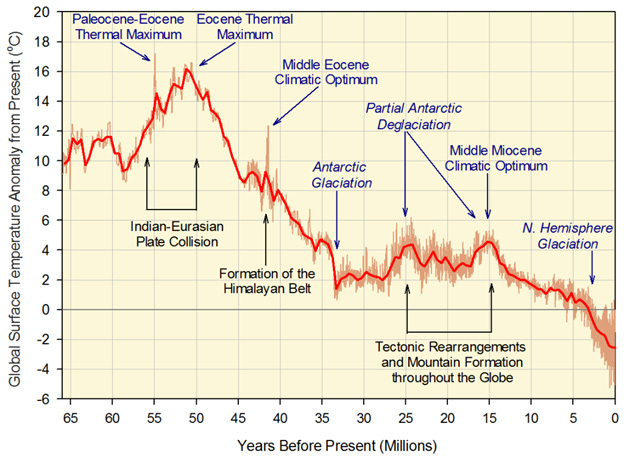 This time another ice age occurred during the Miocene period of evolution. From comparative genetic studies of various primates, It appears that mutations started showing up in the promoter region of the urate oxidase gene. This effectively down-regulated expression of the gene long before it became nonfunctional. Then multiple mutations started occurring in the protein coding portions of the urate oxidase gene (I.e. in the 2nd and 5th exons). Gibbons developed a nonsense mutation in codon 33 and a 13-bp deletion in the ORF. Chimps developed 3 deleterious mutations. 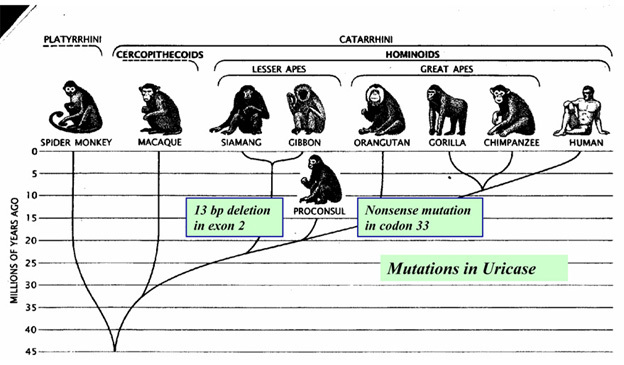 In great apes, the urate oxidase gene mutations occurred approximately 15 million years ago and in lesser apes, the uricase gene mutations occurred 9.8 million years ago. Since humans are genetically more similar to the great apes, we share the same mutation in codon 33. It is thought that this series of uricase mutations primarily happened in Europe where the winters were long and cold and fresh fruit nonexistent. Since there has always been year-round fruit in parts of Africa, it seems doubtful that the mutations happened only there. Later, according to the Back to Africa hypothesis, hominoid migrations back to Africa resulted in the mutations being carried back there. Outside of the cell uric acid is considered an anti -oxidant, but inside the cell, there is evidence that uric acid promotes oxidative stress by multiple mechanisms. First of all, uric acid causes mitochondrial dysfunction, increasing the efflux of mitochondrial free radicals. Uric acid also activates NADPH oxidase, which is a plasma membrane bound producer of free radicals. Thus uric acid causing oxidative stress via mitochondrial and plasma membrane sources of free radicals. Why would a loss-of-function gene mutation like this survive if it increased oxidative stress? Again, the old theories fail to explain the ubiquitous loss of urate oxidase gene function in the large majority of primates. Unlike the GLO gene mutations (which all appear to come from a very old common ancestor), many different urate oxidase gene mutations occurred independently, suggesting again that some natural “selection pressure” existed between 9.8 and 15 million years ago. What was it? Again, cold climates encroached on primate habitats, giving mutants with fat-gaining abilities a survival advantage over their lean counterparts. As it turns out, uric acid is actually a great molecule to promote fat build-up, by increasing the absorption of fructose in the intestine and the liver. Uric acid increases gene expression of Glut5 and Glut2, which are the two major transporters if fuctose. The sugar fructose is at the epicenter of the current perfect storm of the metabolic disease epidemics we are experienced today. First, because of the two ancient gene mutations described above which make our metabolisms extremely susceptible to wreckage by fructose, and second because of the massive industrial scale usage of high fructose corn syrup (HFCS) as the preferred sweetner in practically all manufactured food and drink products. As an industrial food product, HFCS is ideal in several respects. First of all, it is extremely cheap because of the industrial scale of corn production subsidized by tens of billions of dollars of federal subsidies. It is produced, shipped and used on mega-scales. A single train of HFCS cars like that in the video here can ship a million gallons of it. It keeps well and blends into canned soups, packaged meals, cookies, cakes, breads, ice cream, canned fruits, salad dressings, breakfast cereals, sweetened yogurts, cheese products, cough drops, jams, jellys, candy bars, snack packs, ketchup and barbecue sauce, coffee creamers, – you name it. Thousands or tens of thousands of food products, including “nutrition bars” and “natural juice cocktails.” Adding HFCS can delay food product expiration dates and must people think fructose is from fruit and therefore must be good. And it is used in gigantic CAFOs — Concentrated Animal Feeding Operations. “High fructose corn syrup” used to evoke an image in me (Vince) of a wholesome and good product, made out of fresh juice squeezed by hand from healthy corn kernels by Aztec maidens. Perhaps, a cousin of strawberry or orange juice, definitely related to real fruit. Very nice, but far from what is. HFCS is not chemically the same as anything found in nature and is manufactured in large industrial facilities that look a lot like oil refineries. The process is complicated, involving large vats of murky fermenting liquid with Aspergillus fungus, liquid chromatography and multiple steps of chemical tweaking. 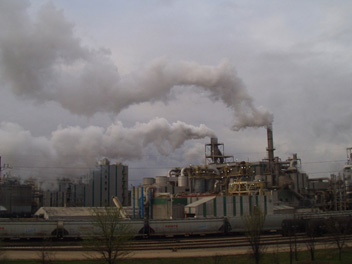 HFCS manufacturing plant in Cedar Rapids Iowa Image source, one of 14+ such plants in the corn belt. Food and drink products with HFCS are sweeter and cheaper than products made with cane sugar. Manufacturers of soft drinks have been able to increase bottle size dramatically without charging much more – from 8 to 20 ounces. And machines that inexpensively dispense immense soda drinks are in all fast food restaurants, pizza shops and convenience stores. While there has been little visable added price cost to consumer, the true costs have been massive, to the consumer and to our health system. The costs show up as increased obesity, metabolic syndrome, diabetes, and chronic disease. So, today, fructose intake has sky rocketed, with the annual consumption of sugar increasing from 4 lbs/year to 130-200 lbs per year from 1700 AD to 2015 AD. Fructose (compared to glucose) is a major cause of metabolic syndrome, obesity, and type 2 diabetes. And tooth decay. If humans did not carry these two loss of function gene mutations, the high fructose corn syrup and high sugar intake that characterizes the Western Diet might not have produced the current epidemic of obesity, metabolic syndrome, and type 2 diabetes. However with this 30-50 fold increase in total sugar and an even greater increase in fructose, our “double knock-out genotype” that protected us from cold winters and famine now has become a true Genetic Scourge. So, if you want to do genotyping to determine a personalized dietary plan, I suggest gene sequencing your GLO gene, located on the short arm of chromosome 8; and gene sequencing your urate oxidase gene, located on chromosome 1. I can tell you now what you will find – these genes don’t work anymore! What does this mean? It means you are prone to Western Diet-induced obesity, metabolic syndrome, hypertriglyceridemia, low HDL, High BP, beer belly, coronary artery disease, Stroke, and type II diabetes! These two gene mutations are 1000 times more important than all of those SNPs that the nutrigenomics companies are trying to peddle on ignorant customers! First and foremost, accept your identity as a “double knock-out”! Your ancestors have carried these gene mutations for millions of years! Don’t sweat the single point mutations that don’t even come close to the significance of the GLO and uricase mutations! And there is a “primate specific diet” that you should be on if you genotype your primate genes. Exogenous Vitamin C supplementation. This of course is what many of us do. Unfortunately this may not work very well because of the poor GI absorption of Vit C. Gene therapy with a messenger RNA encoding for the GLO mRNA would probably be a better way to go, since many mammals endogenously synthesize up to 14 grams of Vit C per day. Another way to go could be to take liposomal Vitamin C.
Avoid “added fructose” like a plague! Fructose is a major cause of hyperuricemia, via a mechanism described in Richard Johnson’s paper below. The mechanism involves transient ATP depletion, and AMP deamination by AMO .deaminase, which supplies more purines to the Xanthine/Uric acid pathway. Avoid manufactured foods, carry a magnifying glass and read the labels in supermarkets and don’t buy anything with high fructose corn syrup listed as an ingredient. Fructose naturally present in fresh fruits and vegetables is not a problem. Reduce alcohol drinks that tend to promote a “beer belly.” In general, this means “beer” (that is where beer bellies come from). The discussion part of Richard Johnson’s paper explains how beer increases uric acid. Consider taking allopurinol, a xanthine oxidase inhibitor medication used specifically to control uric acid levels. It only costs pennies a day and I would recommend a goal of achieving uric acid levels that mirror those found in mammals without the uricase mutation. Humans have relatively low plasma ascorbate levels and high serum uric acid levels compared to most mammals due to the presence of genetic mutations in L-gulonolactone oxidase and uricase, respectively. We review the major hypotheses for why these mutations may have occurred. In particular, we suggest that both mutations may have provided a survival advantage to early primates by helping maintain blood pressure during periods of dietary change and environmental stress. We further propose that these mutations have the inadvertent disadvantage of increasing our risk for hypertension and cardiovascular disease in today’s society characterized by Western diet and increasing physical inactivity. Finally, we suggest that a “planetary biology” approach in which genetic changes are analyzed in relation to their biologic action and historical context may provide the ideal approach towards understanding the biology of the past, present and future.